Simtek are capable of supplying mechanical and electromechanical assemblies in support of the other manufacturing processes and assemblies. This includes all box build operations incorporating fasteners or ultrasonic welding. Cable assemblies can be produced using a variety of termination methods including IDC, MTA, RJ, etc. Other electro mechanical assemblies that are produced include tuned helical antennas, speaker-microphone assemblies, battery chargers and visual display and touchscreen chassis assemblies. 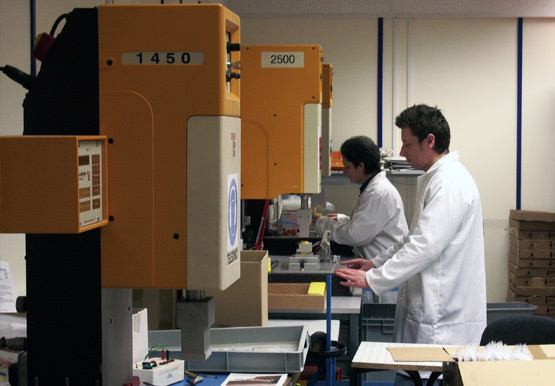 Complete assemblies can be tested to customer specifications or bespoke test gear can be manufactured to test functional integrity of the products prior to despatch. Equipment available includes automatic cut, strip and crimping machines and torque controlled electric screwdrivers. We also have a fully equipped mechanical workshop (including Milling, Drilling and Turning) for jig and fixture manufacturing. For testing purposes we also have a full set of calibrated multimeters, oscilloscopes, spectrum analysers and portable appliance testers. Ultrasonic welding is a process used to join two plastic parts together without using glue or fasteners. The method uses vibrational energy to melt the interface between the two parts, which are carefully designed to maximize the joint strength. Because there is no cure time involved and no extra components required, the process is very fast and produces a joint which is as strong as the material that the parts are moulded from. Primarily Simtek uses ultrasonic welding to join battery case halves together, but the process can be used for a variety of other mechanical assemblies where the cost of complex mould tools can be offset by using a combination of relatively simple components. Customised sonotrode and nest tooling can be manufactured to suit individual customer requirements and advice and guidance can be given as to the joint designs required. Simtek uses a pencil ultrasonic tool specifically for the swaging of retaining pins used to hold PCB assemblies into case parts. This is primarily used in automotive and telecoms products on fairly simple circuits that are to be permanently retained in their housings. Pad printing is used to mark products with lettering or logos. The process uses a flexible rubber pad to transfer ink from an etched plate on to the product surface. Because the pad is flexible, the surface can be convex, concave or even textured. The process therefore fits in very neatly in with the Simtek manufacturing philosophy where a product can be directly marked to customer requirements. Simtek are able to produce etched plates to customer artworks that can be purposefully distorted to give a correct reading result. By using this method we can successfully produce two colour prints onto radio cases, switch buttons and even golf balls. Simtek manufacture a variety of battery packs for different users including marine safety devices and radios, satellite telemetry equipment and asset tracking applications. 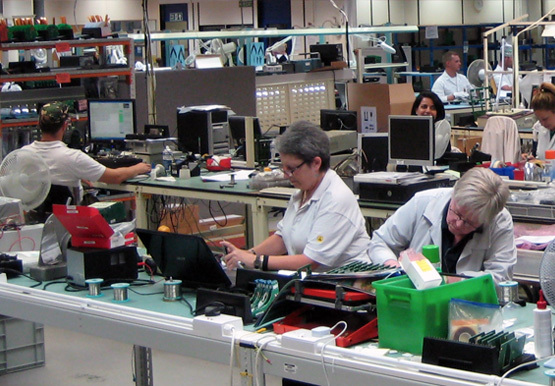 The company is also able produce charger assemblies to complement the batteries produced. Primary – using Lithium or Alkaline cells. Rechargeable – using NiMH (Nickel Metal Hydride) or LiPO (Lithium Polymer) cells. Battery cells are sourced from the world’s finest suppliers such as Energizer, Saft, Duracell and GP. Because of the quantity of battery cells consumed, the price advantages gained can be passed directly on to our customers. Individual cells are combined using nickel strips spot welded onto the battery terminals. The combined cells are then coupled with either wires, thermistors or terminals before enclosing or potting within plastic cases.